Product prices and availability are accurate as of 2019-04-14 07:11:25 UTC and are subject to change. Any price and availability information displayed on http://www.amazon.com/ at the time of purchase will apply to the purchase of this product. bulldoggifts are delighted to stock the fantastic . With so many available recently, it is great to have a make you can trust. The is certainly that and will be a great acquisition. For this reduced price, the comes widely respected and is a regular choice for many people. The Rover have provided some nice touches and this equals good value for money. 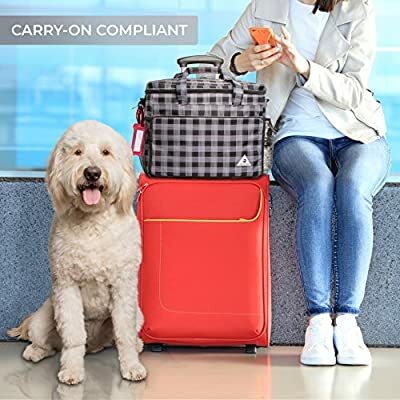 This first class bag makes tails wag! Pack everything your pampered pup (or cherished cat!) needs for a week away from home. Our large, insulated, weather-proof bag includes a removable internal divider, a zippered pocket in the lid, two external water bottle pockets, and a sleeve pouch on back that slides over the handle of any roller suitcase. Every interior of The Rover is lined with an environmentally safe, wipeable vinyl that makes keeping your luggage clean a breeze. Grab a bite from the two sturdy zippered, waterproof food storage cubes that can hold up to 30 total cups of dry kibble or tasty treats! Serve your hungry hound from the two collapsible 4-cup silicone bowls you'll also find included in your set. 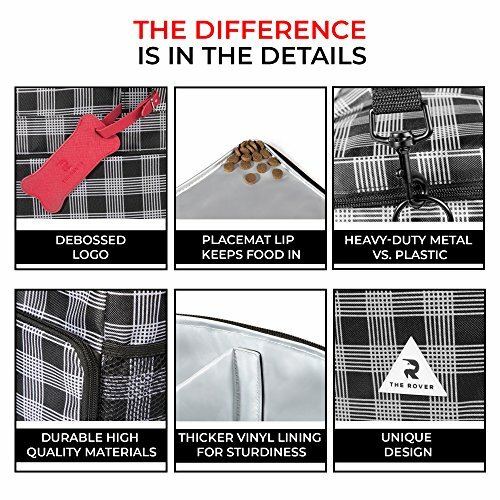 Best of all, our bag also "transforms" into useful accessories, such as a completely removable zip-off placemat that doubles as a storage pouch, and an adjustable shoulder strap that turns into a handy spare leash! The Rover is perfect for camping, flying to an exotic destination, or even just dropping your furry best friend off with their favorite petsitter. 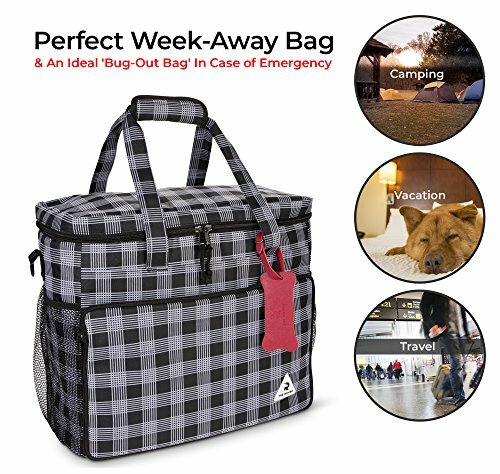 It also makes a perfect "Bug-out bag" to keep pre-packed in case of an emergency, such as evacuating for a hurricane, flash flood, wildfires, or earthquakes. Whether you're journeying near or far, our tote bag is TSA carry-on compliant and always comes with our signature red luggage tag. Pack The Rover and travel in style! 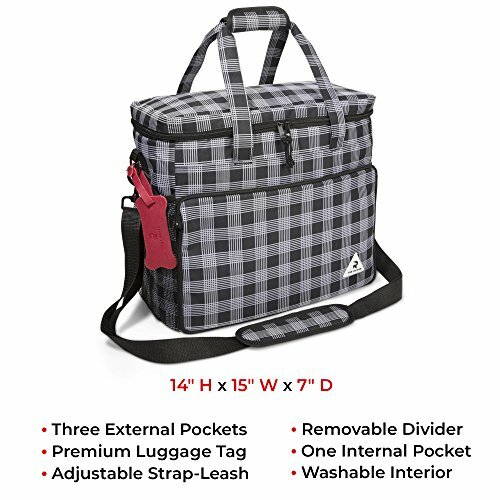 ROOMY, INSULATED BAG - Includes removable internal divider, zippered pocket in the lid, two external water bottle pockets, and a sleeve pouch on back that slides over the handle of any roller suitcase. TSA carry-on compliant and weatherproof! SECRET SPARE LEASH - Forgot your leash at home? No problem! The shoulder strap detaches from the bag to quickly convert to a handy leash with a padded handle! Triple-reinforced stitching and all-metal hardware add extra durability. 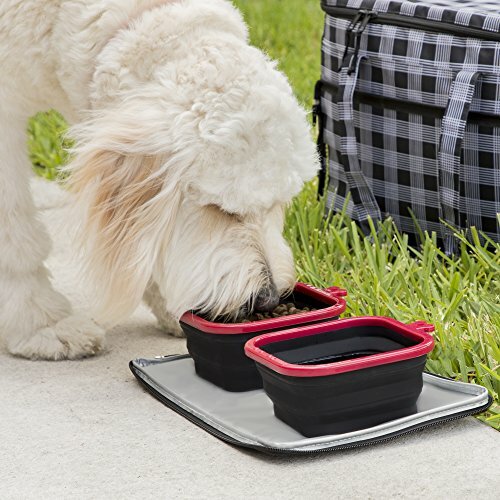 EASY-POUR FOOD CASES - Our two lined waterproof food cases hold up to 30 total cups of kibble or treats and are sturdy enough to pour from directly into your dog's bowl. Is your pup on a fresh food diet? Both cubes are insulated and ready to hold an icepack and your dog's favorite meal for a drive up the coast or a flight across the country! To clean, a quick rinse is all you need to keep everything neat and tidy, no crumbs left behind. 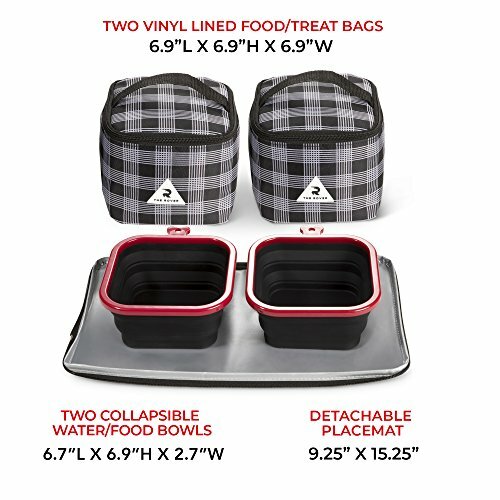 COLLAPSIBLE SILICONE BOWLS AND DETACHABLE PLACEMAT - Two four-cup silicone bowls collapse for space-saving storage in the bag's front pouch. As an added bonus, the front pouch zips all the way off to be used as a detachable, wipeable placemat! Raised edges further prevent food and water from rolling off. "YOU'LL LOVE IT!" GUARANTEE - We at The Rover have worked hard to engineer every aspect of this set to be "The Cadillac of Dog Luggage". There is simply no better quality set on the market. If you're anything less than completely impressed, you're welcome to return it for a full refund.